Build a website for science outreach, allowing the authors to easily change content, blog, add new pages and images, and analyse their website in Google Analytics (~50 pages). The website was built on WordPress as this allows the authors to easily update the content. The theme was originally based on the Twenty Eleven theme. A slideshow with fading images and images with hover effects were prominently placed on the front page, to entice the users with interaction. Customisations to the image galleries and an “ask a scientist” contact form. The Facebook and Twitter widgets are prominently placed, as social media plays a key role in outreach. The styles were modified to ensure that they wrap round to fit on mobile devices. The site was re-visited after it had grown to ~200 pages. 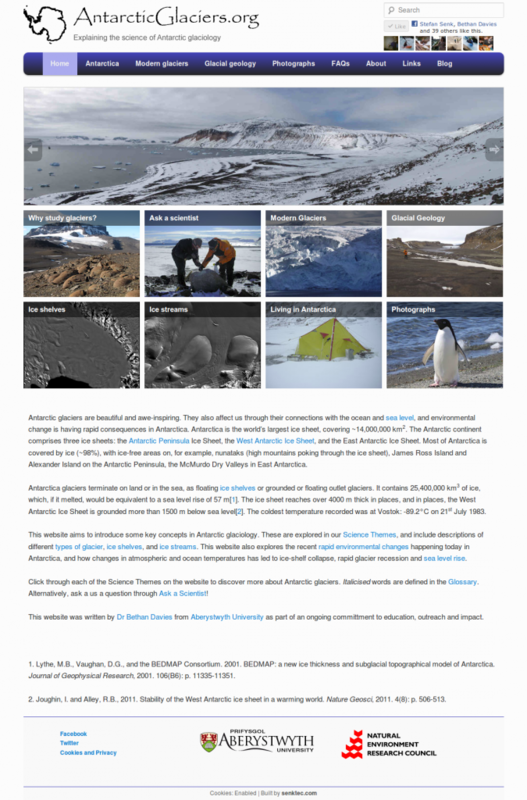 The drop-down menus had grown and were becoming hard to use, so the site was re-structured with index pages listing the sub-pages and displaying their featured images. Greater emphasis was placed on the hierarchical navigation in the left sidebar generated via a customisation of the “Pages” widget. Old page URLs were redirected the new hierarchical URL structure, to ensure a consistent experience, via the “Redirection” plugin. The author name and Google+ profile was added to the pages, so that the author could be associated with the content in Google search results. A customisation of the “Recent Posts” widget was added to the home page to include both posts and pages. Home page — full screenshot. You can see the screenshot of the website homepage as viewed on mobile devices (which have a narrow window) below. Home page on mobile devices screenshot.